The Corkman will go again on Thursday after a powerful finish in this morning’s heat. O'Lionaird in action in Daegu this morning. 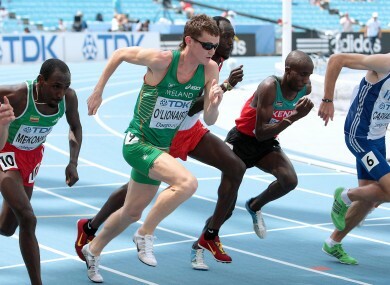 IRELAND’S CIARAN O’LIONAIRD booked his place in Thursday’s 1500m semi-finals with an excellent tactical run at the World Championships in Daegu this morning. After a slow-paced start in the morning’s last heat, the Leevale man found himself in ninth place entering the straight before he delivered one final burst of pace to power into sixth and an automatic qualification spot. In a tightly-bunched finish, O’Lionaird was clocked at 3:40.41, just over half a second slower than heat winner Amine Laalou of Morocco. That time fell far short of the Corkman’s personal best of 3:34.46, which he ran in Belgium earlier this month. Yusuf Saad Kamel and Deresse Mekonnen, gold and silver medallists in Berlin two years ago, also qualified for Thursday’s semis out of O’Lionaird’s heat, while Olympic gold medallist Asbel Kiprop won the second heat in 3:41.22. Email “WATCH: O’Lionaird qualifies for 1500m semis”. Feedback on “WATCH: O’Lionaird qualifies for 1500m semis”.